The original website designer started this project, and the owner ended up calling Big Ten Web Desing to take it over. The original was more of a blog layout vs. what you see today with an organized front page and detailed services pages pertaining to self-storage in the Davenport, Iowa, area. This site sat idle for quite some time before we were called. We added Google Analytics to track website traffic. 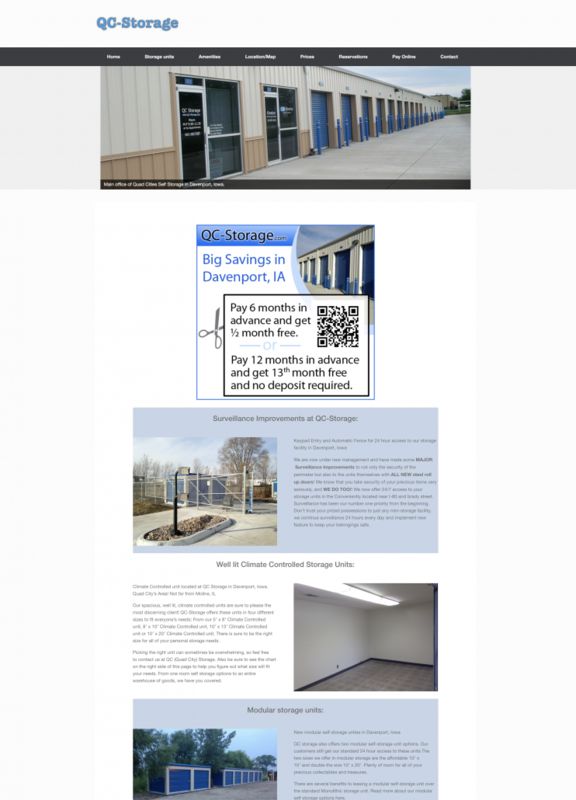 The true telltale sign is that the 48% occupancy rate at this location slowly kept creeping up after the year we reworked the entire website, adding photos and dedicating pages to each sized self-storage unit. The site reached a 96% occupancy and would have made it to 100% but some units were still under construction and weren’t allowed to be rented out. Now if you Google “Self-Storage in Davenport, Iowa” you will find QC-Storage close to, or at the top, of that search. It has stayed there for years now and occupancy rate continues to stay high for our client. We love helping small- to medium-sized businesses like this, just for this reason.